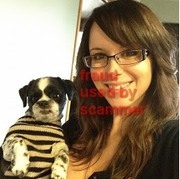 ScamWarners.com View topic - Emelda Zacofsky; emeldazacofsky@gmail.com. I'm Emelda zacofsky.... Single and 30 years of age and need a serious person ...i live in Mesa Arizona. You can send me a message on hangouts BUT "if you can't talk in cam please don't send me a message" Scam bot please stay out of my territory. My email is [email protected]. My name is Amy im a native of Daytona Beach F.L. I'm a intersexual women who's on here to meet new friends. I'm not shy and am very open about who i am so if you would like to talk please feel free to message me.